North Bergen, NJ, APRIL 9, 2019 – Mosquito control services are in demand like never before. But requests are very specific: control the mosquitoes on the property but maintain a safe and green environment for the people and pets inhabiting the space. Mosquito control professionals are in a quandary, one that has even kept many firms from offering mosquito control services. Now, mosquito control professionals can offer home and owners and as well as municipalities a safe and eco-friendly mosquito treatment solution that is green and non-toxic for children, pets and wildlife. Watch the full post-webinar recording on ER-3 by EcoRaider at ecoradierpmp.com/er3. ER-3 by EcoRaider is a green, triple-action breakthrough mosquito formula that knocks down adult mosquito populations, offering barrier by spatial repellency to keep mosquitoes from the area and kills larvae to prevent future generations. 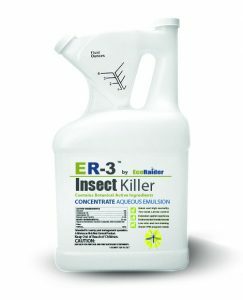 ER-3 is ideal for all mosquito and general pest control needs: affordable, reduces treatment time and has no restrictions. ER-3 is a great way for pest professionals to increase mosquito program revenues with a green, 25b exempt product that does not require spray notifications. ER-3 terminates adult mosquito populations, while offering barrier by spatial repellency to keep mosquitoes from the area and kills larvae to prevent future generations. This triple action formula replaces other larvicide treatments, saving on product costs and service time. 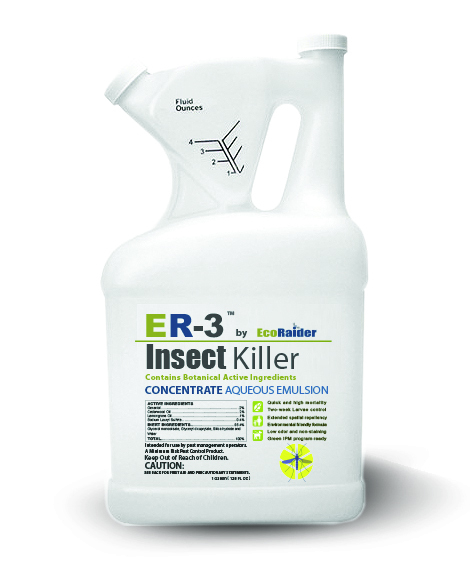 ER-3 by EcoRaider is available at all major pest management distributors. Visit www. ecoraiderpmp.com to learn more. If you missed it, check out the March 14 webinar on bed bug resistance by Dennis Judy. In the webinar, Judy examined all aspects of resistance as well as how to combat it. Resistance is the issue of synthetic pesticides becoming less effective over time in killing or controlling various pests. As species of pests evolve, they become more resistant to existing chemicals and harder to control. Judy, a longtime industry expert, discussed resistance overall, how it came to occur, best practices for resistance management, and the products that are experiencing issues with bed bug resistance. Here’s a link to the recording! https://ecoraiderpmp.com/wp-content/uploads/2018/03/Webinar-Recording.jpg 265 650 Ed DeMask https://ecoraiderpmp.com/wp-content/uploads/2017/04/EcoRaider-PMP-BASIC-LOGO-wz-slogn-300x104.png Ed DeMask2018-03-14 20:27:502018-03-14 20:27:50Missed Dennis Judy's March 14 Webinar on Bed Bug Resistance? Watch it Here! Registration is now open for the free EcoRaider webinar “Pesticide Resistance,” being given by industry expert Dennis Judy on March 14th from 3-4 pm ET. Resistance is likely the most important issue facing pest control as an industry, and Judy will examine all aspects of resistance as well as how to combat it. To register, click here. Resistance is the issue of synthetic pesticides becoming less effective over time in killing or controlling various pests. As species of pests evolve, they become more resistant to existing chemicals and harder to control. Judy, a longtime industry expert, will discuss resistance overall, how it came to occur, best practices for resistance management, and the products that are experiencing issues with bed bug resistance. Judy, who started his career with Orkin, is a member of the Georgia Pest Control Association’s Hall of Fame. He serves as the technical consultant for EcoRaider, assisting in the development and presentation of training materials and webinars for Pest Management Professionals (PMPs) and distributor representatives. The webinar will be approximately 30 minutes of presentation followed by question and answer. Also, PMPs or distributor reps can submit questions online during the webinar. Click here to register for the March 14th webinar. Think about the word performance and what it means in every day society. It’s an expected level of achievement or effort from a person or a product. When you purchase a phone, television, new car – you name it – you have expectations for performance. If it doesn’t work correctly, meaning it’s not performing up to promoted standards … you return it. Because the basic benchmark for any product is that it needs to perform – it needs to do what it’s supposed to do. Pest control is no different. For many years there were green products that did not perform nearly as well as their synthetic counterparts, and the result – pest management professionals (PMPs) stopped relying on them. The same thing has happened to synthetic chemicals thanks to bed bugs developing a resistance to them – PMPs have had to change products or use multiple products in an IPM approach in order to continue to perform at satisfactory levels for their customers. EcoRaider was designed to perform, both immediately and as a residual product. In studies performed by Rutgers University, EcoRaider killed 90 percent of bed bugs on contact within one hour, including adults, nymphs, and eggs. But EcoRaider performs by delivering more than just a quick kill – it leaves behind a residual that Rutgers proved still kills 100 percent of bed bugs after only five minutes of contact even 14 days after application. So, brief exposure to EcoRaider’s high residual efficacy is enough to kill bed bugs of even resistant strains. Beyond the performance of EcoRaider, it also has no issues with resistance. EcoRaider has shown to flourish against all strains of bed bugs, even the most resistant, because bed bugs have zero resistance to the product’s natural ingredients. As you explore the many products available in the professional pest control market, remember to try EcoRaider knowing it performs at the highest level. Geffry Gorman works in the heart of Orlando providing 100 percent green pest control solutions, mostly to rentals, homeowners and public housing. In his 25 years, he’s seen the worst bed bug infestations you could imagine and he’s treated them successfully with EcoRaider. Gorman suggests public housing officials should not only use EcoRaider, but provide residents with two-ounce travel size bottles for when traveling or simply between inspections. “You never see any resistance with EcoRaider and you’d be surprised how happy people are when I give out the two-ounce bottles,” he said. For more about EcoRaider, visit www.ecoraiderpmp.com. https://ecoraiderpmp.com/wp-content/uploads/2018/02/dcbaa743-c4c7-41cc-93a3-01c271526c3f.png 672 1011 Ed DeMask https://ecoraiderpmp.com/wp-content/uploads/2017/04/EcoRaider-PMP-BASIC-LOGO-wz-slogn-300x104.png Ed DeMask2018-01-22 01:27:282018-02-09 01:29:52Testimonial: "Why EcoRaider Works in Public Housing Facilities"
We had an incredible show at PestWorld 2017 in Baltimore this October but it would mean nothing without those of you who visited our booth and took part in our giveaways – thank you very much from all of us at EcoRaider! EcoRaider was also lucky to have Bill Hastings, Director of Special Services for suburban Chicago-based Rose Pest Solutions, working in our booth throughout the show. Hastings has been an EcoRaider customer for more than three years, and he volunteered to share his many positive experiences using the product for bed bugs and other insects with PMPs visiting our booth. 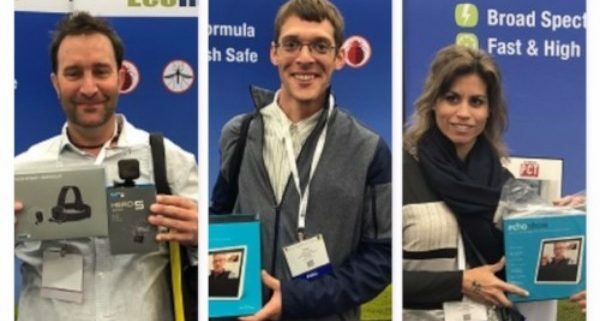 We gave away a GoPro Camera and two Amazon Echos during the first three days of the show – creating a lot of smiles while sharing the details about the industry’s leading green bed bug solution. PMPs in the United States who submitted business cards or had their badges scanned will hear from our sales representatives directly, while those professionals from overseas will be followed-up by our corporate office. We appreciate your interest in EcoRaider and we’re looking forward to serving you as a customer. If you weren’t able to visit our booth during the show and want to learn more about the product, visit www.ecoraiderpmp.com. Also, follow us on Facebook, Twitter and LinkedIn. https://ecoraiderpmp.com/wp-content/uploads/2017/12/df7ab096-8cce-44d1-95a4-f9f6291a1701.jpg 600 600 Ed DeMask https://ecoraiderpmp.com/wp-content/uploads/2017/04/EcoRaider-PMP-BASIC-LOGO-wz-slogn-300x104.png Ed DeMask2017-11-05 20:33:442018-01-23 16:42:55Congrats to Our Giveaway Winners and Thanks for Visiting the EcoRaider Booth at PestWorld 2017!